Restore 8th Avenue and Prospect Park West to two-way traffic flow. NYC DOT has done all it can to reduce speeds on 8th Avenue and Prospect Park West with signal timings, but it’s just not enough. Two-way streets are a proven-effective means of reducing vehicle speeds. 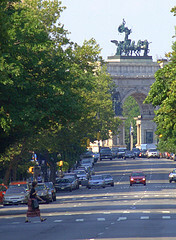 Making Prospect Park West and 8th Avenue two-way will increase access to Grand Army Plaza, greatly alleviate congestion at 8th Avenue and Union Street, reduce through traffic on 15th Street, and improve overall traffic circulation. Install a two-way, curb-protected bike lane on Prospect Park West along the park. Prospect Park West has long been an important link in the New York City bicycle network. Since Prospect Park West has extra capacity, one vehicle travel lane can be given over to a Class I bike lane without compromising traffic flow. Implement comprehensive traffic-calming infrastructure along both avenues, including neck downs, leading pedestrian intervals and daylighting. Affiliation,	comments, willing to volunteer? Check this box if you do not want receive more info about this and other issues.